Karrie Hovey is an installation artist, who’s work explores the relationships between the human landscape and the natural environment. The three primary areas of exploration affected by human meddling include botany, evolution, and geography. Her work typically incorporate textiles and repurposed consumer packaging. Hovey was raised in the Northeast Kingdom, a rural area in northern Vermont with a strong craft culture. She received her BFA from the School of Visual Arts in New York where she was awarded the prestigious Bea Feitler Scholarship. She received her MFA with Honors from San Francisco State University as the Art department’s Hood Recipient. She teaches at Dominican University and resides in Fairfax, California. 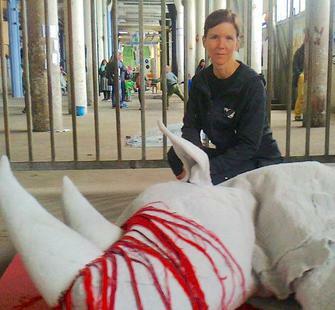 Hovey travels widely to inform her art practice and her wildlife advocacy. She has been granted artist residencies, fellowships and exhibitions throughout the US, Europe, China and South Africa. These include the Headlands Center for the Arts (US), the Terra Foundation (FR), the Nirox Foundation (SA), the Everson Museum (NY) and a site-specific solo exhibition at the Telfair Museum (GA, US). In the upcoming year Hovey will be attending Ulovane Environmental Training Program in South Africa to further her anti-poaching efforts.